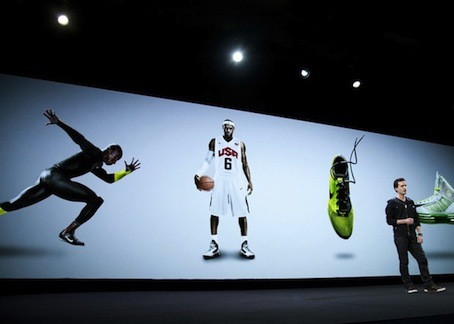 For decades Nike has been setting the precedent and continues to be a leader in athletic footwear. It was in the early 1980′s that they introduced Nike Air technology in basketball shoes. Soon after the air was used in almost all their performance footwear. In 1987 the Nike Air Max commercial (featuring the Beatles’ song Revolution) debuted a brand new shoe unlike any other – exposing the air bag for the first time. When it comes to developing technology in athletic footwear, they have stayed ahead of the game. Not only are they leaders in product development but they revolutionized marketing shoes by utilizing the biggest athletes in the world. Michael Jordan’s partnership with Nike is said to be what started it all. (Although it could be argued that Chuck Taylor’s partnership with Converse was really the beginning). This week a new running shoe was debuted at the Nike Innovation Olympic Summit in New York City; the Flyknit Racer. Olympic Gold Medalist Carl Lewis was on hand along with others for the debut. The shoe was developed as part of a new product line for athletes to compete in for the 2o12 Olympic Games in London this year. Nike Flyknit Racer is seamless; using the lightest of yarns to weave the shoe to be like no other. This shoe is said to be much lighter than the Nike Zoom Streak 3, which was also designed for Olympic runners in the previous games. It’s engineered to mold and move with every step a runner takes. The style is so form-fitting they feel like you aren’t wearing anything at all – like a second skin. The shoe won’t be available to the public until July 27, 2012.